MC5 are rough. Good and rough, and ready. They play rock'n'roll with no frills. Just thrills, no cream, no stunning musicianship. Just hot randy rock - and they're great to watch as well. No, that's no handout, that's no press release. 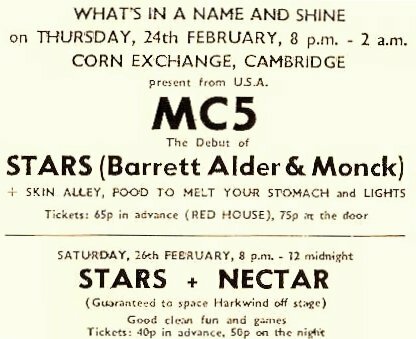 I just happened to catch this live-wire Detroit outfit at Cambridge Corn Exchange last week. The band took the stage like they were all ready to pack up and go home. They didn't even look the part. Christ, they didn't even have long hair. There was a meandering, deafening tune-up, then a longish pause. ... And then, zowee! Wayne Kramer spun around in the air about two-and-a-half times, and as he hit the floor he hit a chord so hard he could have neglected amplification. The band collapsed into a riff behind him, and got steaming so quickly that the audience was nearly caught with its trousers down.